This seminar will teach you how to properly secure your Microsoft Access databases. But that's not all. You will also learn how to build proper security into the workflow of your database so that you can control every aspect of a user's experience, and monitor their work as well in a database log. You will learn how to properly secure your Access databases to control who can log in, who can edit data, and who can make changes to the database itself. But that's only the beginning. You will learn how to build a database where you can control every step in the "work flow" process of data entry, and create a system log so you can see who is doing what. additional details. Scroll down to find them. Description: Learn how to properly secure an Access database and control the "work flow" of information with user and group permissions. 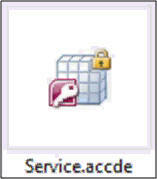 Versions: I use Access 2007 in the videos, however the lessons are valid for all versions of Access back to Access 2000 and work just fine with Access 2010. I will show any differences between 2007 and 2003. The lessons on the User-Level Security Wizard are specific to Access 2003. 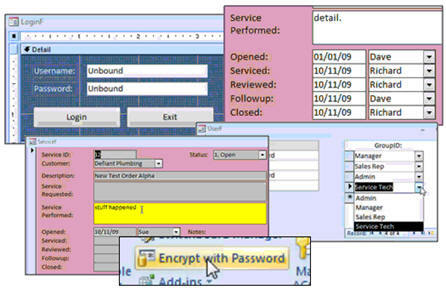 You will begin by creating a user information table (with username, password, and other data) and a secure logon form. This will allow us to control who can log on to the database. Next we'll set up a Group form so we can assign users to different groups, like SalesRep, ServiceTech, Manager, Admin, etc. In the next lesson, we'll define a "work flow" for our database. This will control how information is entered by our users. For example, our database will be for service work orders. Our work flow will consist of a sales rep entering a work order, a service technician performing the work, a manager reviewing the details, the sales rep follows up with the customer, and then the manager closes the work order. You will be able to control which users will be able to enter data into which fields. For example, only service technicians can enter data into the "service performed" field, but not the "service requested" field, which is the job of the sales rep.
We will control each step of the work flow process with buttons that signify that a user is done with his work, and the work order is ready for the next person. Here you can see a "service call completed" button that will then send this work order to the manager for review. This work order will then be locked out so the service tech can't edit it any further. 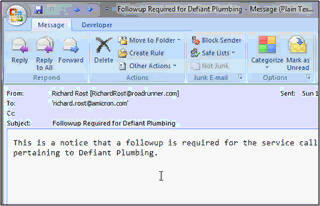 You will learn how to send Email notices from inside the database when needed. This is great if you have employees that don't check the database all the time, so as to say, "your assistance is required." The database will log every step in the work flow procedure. You will be able to see who did what, and when. We will also create a system log table, so we can log everything that a user does: what time he logs on, what data he adds, what records he changes, etc. You name it, we can log it. You will learn how to build your own internal database security. For example, do you want sales reps to be able to edit other sales reps' customers? Do you want service techs to be able to see customer data if they're not working on that customer's work order? Who can edit, delete, or add new customer records? What information should be required for new customers? Some of these are things you just can't do with standard Access User-Level Security. ...will be completely different from what a simple service technician sees. This will help to control who can do what in your database. We will spend a lot of time learning how to lock down your database and secure it from intruders. We will split the database into front-end and back-end files, encrypt the database with a password, turn off the Navigation Pane (database window) to keep people from poking around in your objects, set a Startup Form, and disable the Bypass Key so people can't go to the Navigation Pane directly when the database starts up. You will learn how to dynamically link to tables in your back-end database using VBA code to overcome some security problems. We will encrypt the front-end database into an ACCDE file (MDE file for older versions of Access). This will effectively secure the form, report, and module design capabilities and prevent people from viewing your database in design mode. For our Access 2003 users, we will spend some time going over the User Level Security Wizard. This wizard will secure an Access 2003 database and provide "OK" security if all you want is to keep Joe from Accounting from poking around in form design, and seeing data he's not supposed to. It's not hack-proof, however, but it does provide "quick and dirty" security in a pinch. We'll set up users, passwords, groups, and permissions. This seminar is perfect for anyone who wants to learn how to secure an Access database, prevent someone else from accessing parts of the database they shouldn't, assign permissions so you can control who does what, and create a work flow strategy in your database. This seminar is long (over seven hours) but it's broken up into easily managed lessons of about 10 minutes each. You can sit down, watch a lesson, review the material, test the code out yourself, and experiment. Do a little bit each day. It's long, but it's comprehensive - you won't miss a single step as I've recorded everything from start to finish. Click here for another video showing my step-by-step lesson plan guide to what's covered in each lesson of this seminar in detail. Click here for a video walk-thru of exactly what this database does, and see how the flow of information going into the database can be tightly controlled from sales rep to service tech to manager. All of the sample database files for this seminar are available on my Web site (instructions on where to download them are in the course videos). They are available in Access 2007 and 2000 formats. - Sending an Email notice with Outlook for the "next step"
- Users can't bypass the "work flow"
- Who can browse customers? - Who can see service reports? - Turn off Navigation Pane, full menus, toolbars, etc. Richard on 11/1/2009: Now that you're finished with this seminar, make sure to check out my ACCESS SPLIT DATABASE SECURITY SEMINAR and ACCESS DATA ENCRYPTION SEMINAR for even MORE ways to protect your Access databases. David Sterner on 11/3/2009: In Access 2007 when creating a list or combo box you can select the sorting order as part of the wizard. In 2003 what is the easiest way - write code in the row source? Richard Rost on 11/6/2009: David, in 2003 and earlier, the EASIEST way to sort a combo box is to make a QUERY that's sorted, and then base the combo box on the QUERY. Otherwise you have to manually add the "ORDER BY" clause to the SQL (or invoke the query builder inside the combo box, which is a pain too). David Sterner on 11/18/2009: Hi Richard: For lesson 24 I want send an e-mail notice and I want to cc two individuals also so I created string variables E, CC1 and CC2. Access help says that CC1 and CC2 should be separated with a ";". But I get an expected: end of statement error. Is there a different separator I should use? Richard Rost on 11/19/2009: Hmmm... interesting. Have you tried just a comma? Dave Sterner on 11/20/2009: No a comma doesn't work - doesn't that just set it to the next property to the right? Dave Sterner on 11/20/2009: Got it, thanks. Monty on 12/18/2009: On lesson 26 in Access Database Security Seminar, when I click on my database and then hold the shift key down and then double click back on it, it doesn't bypass the startup options. I have Access 2007 version. This is a good thing I guess. I just thought to mention it to see if it's happened to anyone else. Paula Stroud on 1/6/2010: Richard, at Time Index of 4:30. It appears an "End If" is missing. Unless I missed it. There are 2 places it could go ... at the end of the If Msgbox() statement, or at the end of the Sub. Doesn't work at the end of the Sub. Robert Fleming on 1/26/2010: How do I get the main menu to open and only show to buttons that the logon user is allowed to see. Dave Sterner on 2/11/2010: Richard: I keep going back and trying things with this fantastic seminar. One thing that I was going to mention that I thought was missing was a menu button to allow the current user to change his/her password, username and e-mail address. Robert Fleming on 2/23/2010: Your answer of 2/9/10 is bending the truth. It is nice to say that your copy of the database works find. But in fact if you look at your database after completion of lesson 20 it does not work. You had to stand on your head and spit nickels to get the code to work properly in Lesson 25. A decent answer would have been that after completion of lesson 25 the code problems are repaired. You know Richard when I ask a question I would appreciate an honest answer not a brush off one. Am I asking for too much? Dave Sterner on 2/23/2010: Regarding the Me.Undo to revert back to the original record entry, what if you are working with a subform in a form. How do you undo the record of the subform? David Sterner on 5/18/2010: I am revisiting so I apologize if you covered this somewhere in the seminar. In anticipation of transferring the split database to my client's server I played around with the "what if" of relinking the tables db to the front-end db, given that there will be different file locations on my clients server than on my computer. After splitting and linking, as in Lesson 26, I moved my table db to a different directory and took the same steps to re-link and it linked some but not all of the tables and I started seeing tables listed in the navigation pane that I had long since deleted. For the unlinked tables, the front-end was still trying to find them in the original link directory. I was able to link them one by one using the linked tables manager but this seems like a pain. David Sterner on 5/18/2010: Follow up on my previous submittal. I realized that it was not showing old files that I had deleted but was listing my existing tables and a replicate renamed with a 1 at the end. These replicates show a correct linkage but of course my front end is not using them but is trying to unsuccessfully access my original tables, still linked to the old directory. Amrik on 10/31/2010: Hi Richard, enjoying your course Seminars, and the one on Access Security the typo for 'erviced in lesson 19 @ 01:31 for..StatusCombo = 2 'erviced.. was corrected further down in lesson 22 @ 09:05. Harry on 2/28/2011: Why do you use a list box rather than sub form on CustomerF? Harry on 3/1/2011: I'm wondering if one could use a Case Statement when locking/unlocking fields depending on Group membership. I'm thinking if there is a way to list the groupID's in such a way that the broadest permission appear first, then admins (for eg) would not see Sales related formatting (for eg). Tran on 3/31/2011: Could you please explain why we can pass the name of the combo box "SalesRepCombo" to the function CurrentUserID () ? Derek on 5/18/2011: Could we further the security of the DB by creating a hash of the users password and storing that in the table instead of a clear-text password field? We could then retrieve the hash from the table and compare that hash value to a hash value that was attempted. WILL on 7/20/2011: In Lesson #4 instead of having a list of groups: manager, sales rep, service tech, etc. is it possible to have all positions showing on a subform and use check boxes to select what group the user is in? Dylan Kiner on 8/23/2011: I love this seminar. This is awesome and the instructor is clear, precise and right to the point. Thank you! Hector on 10/28/2011: If you are using SQL on your sever the database is secure right? Sissoko on 12/7/2011: I want to be sure, that playing around, with th table connection, is secure, specialy if 5 to 6 people are using the back end. Sue on 5/8/2012: HELP! I have typed the code as follows (7:35 in tutorial) but when I test it with the correct pairing of Username and Password, I get "Runtime Error 94" Invalid use of Null and the debug takes me to the X= line of code. Sue on 5/8/2012: Nevermind - somehow my data disappeared - so it was really getting an error that was then fixed in the next step - which I hadn't seen yet! Sorry, new to the videos!!! will powers on 6/26/2012: can you explain the difference between putting a string in the title verse lower in the code. Scott Adkins on 7/7/2012: Richard, I have some screwy stuff going on. first, I put the admin menu in and I have double checked the code. Most of the time, I cannot get the admin form to open. Once in a while, I can change from design view to form view, but I am not sure why it will not open up all the time. Deon Riley on 7/23/2012: Hi Richard, I have used the security seminar to great effect in building a database for our organisation's risk management department. Steven S on 7/27/2012: I think that would be great to have an addendum to cover this topic! Hilary Dillah on 9/14/2012: Hi Richard, I have one problem now. :-) My office pc cannot open the database and close back the access program after I clik ok at the message "Unrecognised database format". During initial programming I have no problem opening the database at office pc. If I not mistaken, it's only happened after I put in some security features from the seminars. I'm using Access 2007 at the office and my home pc has Access 2010. The strange thing is, I have no problem at all opening this database at home. Thanks..
Rose on 9/20/2012: In lessen 5 you talk about Group Permissions to be able to open the form and Lessen 10 allows them to add, delete and/or edit records in that Group, but they can see other records of the same group. I need the group that have Permission to open the form and open where the UserID can view and work on only their records. I need help to add the view or filter where the current UserID() is inUserGroup and can view and work on only their record. Lilly N on 9/24/2012: Richard, thx so much for your help. Dana Michaels on 11/21/2012: HELP!!!! I desperately want to disable the Customer drop down from changes after the order data has been completed. For Example - the sales person types in the order - moves to a new record at this point I want to disallow any changes to the form chosen Client by sloppy data entry. Dana Michaels on 11/23/2012: After all the complicated gyrations I went through trying to work this problem out - your solution is so sweet and simple. Please don't ever retire!!!!! thank you so much. Dana Michaels on 11/23/2012: I spoke too soon. Me Allow Edits works great but it not only locks the Customer Combo (LuClient)it locks all the data on the form. Short of changing my whole database which has been running Registration for the past three years - I tried adding a check box and using the on click Event(in current) that would allow edits but didn't work - I see in the next chapter you are unlocking fields on the form so logically speaking I should be able to lock only the combo box. Dana Michaels on 11/23/2012: quick question - what if the database in question already has linked tables - how will this affect them? A Lucas on 12/17/2012: Hi Richard & Crew. Hank Mark Weier on 1/10/2013: Hallo Richard, I've just downloaded the Access security Database, but am not able to use it, is this because I'm using Access 2010 or simply doing something wrong? Thanks in Advance. Scott on 1/25/2013: Hi Richard. I am doing this seminar again, and still wrestling with a problem that we have talked about at length in the past. jerry freeman on 3/13/2013: Richard: I have a form that uses a combobox to select a teacher, then on the subreport, all students to that teacher are displayed. I want to be able to send an email to all email addresses in the student subform, any suggestions? Lisa Theodor on 3/13/2013: Hello. Lisa Theodor on 3/25/2013: Lesson 36 - I am getting a compile - user defined type not defined error. on 3/26/2013: The first line is highlighted but it does jump to the dim db as database line also. I have reviewed all of the lessons but did not use the other stuff because I didn't need that level of security. Natassja M on 4/1/2013: This would be great to see! Or a "forgot password" button for self sufficiency? Bruce Reynolds on 5/28/2013: If you inadvertantly destroy your system tables, is there a recovery procedure to restore the system tables? Bruce Reynolds on 5/28/2013: I wonder how much Microsoft charges for Microsoft SQL server? It's gotta' be in the thousands of dollars per seat. Bruce Reynolds on 5/28/2013: When you set rs = Nothing, are you making rs = 0, or rs = Null? Bruce Reynolds on 5/28/2013: This was a VERY comprehensive seminar, and to me represents another Best Value. Colette on 8/11/2013: Great Lessons. I have created login form for users with group permissions. Now, I wonder how to permit end users to change their passwords. Larisa Kiseleva on 9/11/2013: I am very happy with all topics you covered with this seminar. It helps me a lot. But you miss to show how to do limited acess to the form main navigation with tabs. I did figure out. Boston S on 9/22/2013: In lesson #3 you created a main menu form that showed the logged in user. How can I add a list of projects to this form so only the logged in user sees only the projects he is related to. In addition, how do you use this value for other forms? Inderjeet Puaar on 12/3/2013: Sorry i managed to figure it out the create links error. Simple typo error on my part. Kevin Robertson on 12/10/2013: Going by your screan shot, you have declared one of your Global Constants as BE PASSWORD but you refer to it later in your code as BE_PASSWORD. Appears to be a simple typo! Joni Moore on 1/4/2014: What if my users do not have a full version of access so they can't tell Access which folders are trusted for them? Vannak Hou on 2/4/2014: Richard, I right clicked on the "Exit" button and type in VB DoCmd.Quit. Close, Save. Then Reopen, try to Exit nothing happen. I made it's on the actual button. Am I doing something wrong b/c the form is not exiting? Vannak Hou on 2/4/2014: 0850 .. this is a pretty course Richard. Since I do not have knowledge of Visual Basic Course. Any suggestions? Uriel Ramirez on 2/12/2014: I have notice that if you encrypt with password the front end database, you will be prompt for password when trying to link or import tables from it. Elissa Peacock on 2/23/2014: Richard, I enjoyed your Access Security Seminar very much. I put a button on my MainMenuF form to allow users to change their password. It works. The only problem is that I have to select the right UserID number from the record selector. If there code I can put in my password form to do this automaically based the User who logged in. THANKS! Richard Lanoue on 4/18/2014: How do 2010 access encrypt database? it's not in database tools? David Koehler on 6/12/2014: Thank you very much for leaving your mistakes in the videos. A great sign that you are one helluva teacher. David Koehler on 6/12/2014: Is there a download sample of this security database that I may get a copy of. Robert Rivera on 7/14/2014: Hi Richard. Tareq Salloum on 12/22/2014: I have a question and hope to get an answer from you. I have created a database with user names and passwords. Basically, all users can have access to the records (the way I set it up). Is there a quick and dirty way to log the name of the user who changes any field in a record? I don't care what the change is, I just want to know that there was a change made by a user. I have watched your Access Security Seminar and you have showed how to log activities of users for each filed. But is there a way to just check all of the fields of a record? Thanks a lot! Bonnie Staib on 5/23/2015: Richard, I have just finished working through your outstanding Security Database. In a rating of 5 starts, it gets 10! I do have two questions on the later lessons. Bonnie S on 5/27/2015: Alex, thank you for your reply to my questions. I appreciated you saying I did need to compile the database before making the ACCDE file. Re my second question: You asked if I was unlocking the database and leaving it open for others. I only unlocked it because I could not replicate the actions that Richard was getting in the video (as Admin signing in to the ACCDE file, and at Lesson 36 @ 9:35, he commented "notice for me I ve got all my full menus because of the db properties in the admin button we created. I could not get that without unlocking the db. However, I would immediately do what I needed to, then relock it. I understand that the normal place to continue development is with an unlocked development copy. I was simply trying to follow the video. Brian Merrick on 7/31/2015: Does it affect your database if you don't set the field length and leave it 255? Brian Merrick on 8/4/2015: How can i create it so that the open call shows up on the Main Menu, until i close it. In order words, i want to have my open calls show up on main menu as a list form until its closed. Brian Merrick on 8/12/2015: I get the error message invalid Logon when i enter the correct password. What am i doing wrong? Brian Merrick on 8/24/2015: When i go to a blank record in the customer form and double click on the list box which is empty i get a message that says this is not your customer. Brian Merrick on 9/4/2015: When i trying to encrypting my backend database i get an error message. Encrypting with a block cipher is incompatible with row level locking. Row Level locking will be ignored. what does this mean. Brian M on 9/4/2015: Yes i am. Brian on 9/5/2015: Ok I will check. Brian Merrick on 11/30/2015: How do i archived the closed files in the database for the closed calls? Brian Merrick on 12/8/2015: I want to create a query so when i close my calls they don't show up in the listbox. How do i do that? Anne Burlas on 12/23/2015: The passwords using this code are not case sensitive. What am I missing? Vannak Hou on 3/22/2016: Richard, you think you're going work on Access 2010 or 2013 Security Access soon? Vannak on 3/23/2016: At the end of the video, all the sudden there is an Exit button without any explaination. Took a moment to figure it out. I know the video was made a while though. Brian Merrick on 5/31/2016: I get an error message when i double click on the service call within the listbox. Brian Jensen on 7/13/2016: After adding this feature, which works, however I am still able to see the privacy option under file that allows the user to get into all the DB settings. In the video it show no options. What needs to be done to prevent the user from seeing the privacy options? Brian Merrick on 9/2/2016: I have a products database, i have made a products table, Materials Table and a Magazine Table. I have multiple product that use multiple materials. I created a list box to show the materials for each product, but it's double each materials twice or three times. some help please. Brian M on 9/6/2016: Yes, i created the junction table for product and material. I also query with the product and material table and used a vb code =[Forms]![ProductF]![MaterialID]. I did not used the junction table. Joseph Risse on 10/1/2016: Alex, I think Brian Jensen (07/13/16), is referring to Access 2013. I see the same issue. There will be File and Home for the menu at the top. When you click on File you should see a circle with arrow in the left side to bring you back. Print , Privacy Options, and Exit. On the right side, you will see Quick Print, Print, and Print Preview. Dan Gettinger on 1/4/2017: When I create the QUERY for the list box as you have done, I end up with a line for each status. Any idea why and what I need to change? Using Access 2013 if that matters. Dan Gettinger on 1/4/2017: Disregard my previous question. Figured it out. Needed to add the relationship between the StatusT and the ServiceT. Chris Thompson on 1/22/2017: Just as a note, you speak of Access 2003 Back Color 12615680 @8:07. There is a relationship to this number and the numbers used in the later versions of Access. The above decimal number is equivalent to hexidecimal #C08000. You need to reverse the bytes to #0080CO or 00 80 C0. These bytes are then translated to decimal 0, 128, 192 respectively. If you put these three numbers into the RGB function as in RGB(0, 128, 192), you will end up with the same resulting colour. Chris Thompson on 1/24/2017: Using Access 2010... I'm having difficulty with the ServiceListBox. While I seem to have all the same underlying properties set the same (although I may have missed one :) ) later in lesson 14@4:52, I attempt to select an item in the list box. However, for some reason when I do, I only get a faint border around the fist line in the box - that is, I cannot select (and see the black background) of the actual item that I have selected. When I Googled this I found one instance where they found the reason was that the listbox is unbound on a bound form. Unfortunately, they don't detail the solution. Seems to me that this listbox should work regardless that the form is bound to CustomerT. Any Ideas? Chris Thompson on 1/24/2017: Richard / Alex, never mind about the list box... Somehow it is working again. I suspect I may have had a tech selected in the MainMenuF which makes the CustomerF.AllowEdits to be false. Chris Thompson on 1/27/2017: Just a note. Chris Thompson on 1/27/2017: At 5:00 when we are creating the database Links sub, shouldn't we be placing quotes around the password as in: "MS Access;PWD='" & BE_PASSWORD & "'" or does it matter? Chris Thompson on 1/27/2017: At 12:00 when I create my database links, I get all of my tables as expected; but I also see (Using Access 2010) 12 more tables prepended with "MSys"... I assume if I just leave them, they will also get destroyed later. I also assume that I can use the td.Name to find them as we are creating the links and bypass including them - with the proviso that we do not name any of our own tables starting with "MSys"
Michael C. on 1/27/2017: Excellent seminar! I started this last year, but wasn't where I needed to be in terms of VBA, so I started working through the Access 300 series and this time around, the videos made much more sense. I've replicated the DB through video 25 and will finish it off this weekend. Thank you for this amazing seminar. Chris Thompson on 1/28/2017: Hi Richard / Alex, just a followup on my feedback I wrote yesterday regarding system tables being also grabbed from my BE tables... Well, I should always check twice before running off. The issue was that I Spelt the variable Attrib incorrectly (atrrib). Once fixed, the code ran as demonstrated by Richard. Thanks for all your efforts in helping us through the myriad of tasks that finally make an Access app somewhat useful. Alecia O on 4/6/2017: I have the "If IsUserInGroup() Then .visible = True _ Else .visible = False _ End If" code set up for various groups & controls in my OnCurrent event. The login form is set up the same as the example in the video. If I log in as a user with limited permissions, it shows all buttons unless I click the Refresh button. Shallena A on 4/17/2017: Dropbox keeps creating a conflicting instance of the database. I saw a comment somewhere that said Microsoft SQL Server Express would work better. What do you think would be the easiest way to share my database with my other people? Shane Johnson on 5/9/2017: Richard sorry it was what I thought just a glitch. Went back and deleted the 0's noproblem but did compact and clean up yesterday before I quit. Valerie on 7/9/2017: Hello, My GroupSubFormF will not display in continuous view as shown in 14:34. I have set the form to continuous view but it is only showing the first record, Manager. Valerie Fontenot on 9/20/2017: Lesson 31 7:55. Is there any advantage of having a login the same login process in your back end databases as in your front end instead of using a password for your backend? Valerie Fontenot on 9/20/2017: Lesson 32 1:30. How would I add a text box to the Admin form that would tell me if the bypass key was enabled or disabled? Valerie on 9/20/2017: What is the difference between splitting a database and creating an .accde file? Don't you split the database when you create an .accde file? Valerie Fontenot on 9/24/2017: When will questions be posted that were submitted after April 2017? Valerie F on 10/4/2017: Thank you Alex. Messages have been going to my Junk folder. Valerie F on 10/4/2017: What code would I use for the label option? Valerie F on 10/7/2017: The label option you referred to in your reply to my original question, "When you set up the bypass option you could then either update a new label on the form, or you could update a value in a settings table and show that value on the form." What code would I use to update the new label on the form? Eric Michalek on 3/3/2018: Brian asked about field length (security seminar about 4 min in) reply was not so much now. So what/why is it still there? Does it speed up the database? Will it take up memory? Could you please expand on this? Thanks. todd Kaplan on 3/14/2018: Rich, I am using Access 2016. I not able to create an ACCDE file. It gives me an error. When aski9ng the Google machine, one forum tells me to compile the VBA code in debug, if there are no issues, it will allow the creation of an accde file. When I try this, i get an error to compiling with the use of Form_Current. Did this change in Access 2016? todd K on 3/19/2018: I found the issue and fixed it, thanks. Sue Bartlett on 1/14/2019: Hi Richard, I'm running Office 365 and coding this. It keeps "gagging on the Ctl.Locked and Ctl.Backcolor when I try to run it. Is there a change in the VBA code now? I THINK I checked my code against yours and it looks the same.